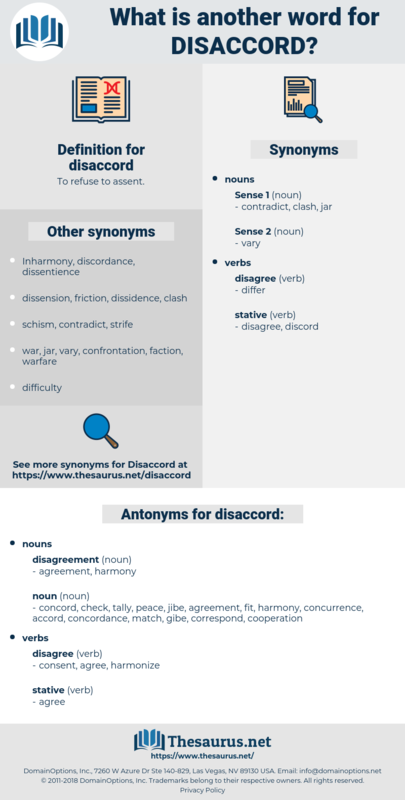 What is another word for disaccord? check, correspond, concurrence, peace, gibe, cooperation, concordance, match, jibe, concord, tally, fit, accord. But this rule should particularly be observed in the use of adjectives, which are always ill - joined with their noun when they disaccord with the impression the reader has in his mind. He listened to them quietly, in impenetrable silence, and never fulfilled any of their requests, because they were all in disaccord with the regulations. 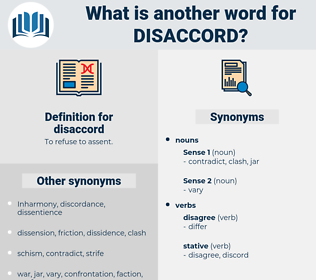 degraded, discrete, degrade, dissertate, decreed, djakarta, dog-eared, discreet, discredited, dose rate, deserted, discard, disaccharide, disarrayed, desecrated, disagree with, degree day, dasyurid, dasyuridae, desired, desert, dockyard, dogcart, desecrate, desegrated, discredit, decorated, dessert, discarded, ditch reed, Daucus Carota, discord, decorate.